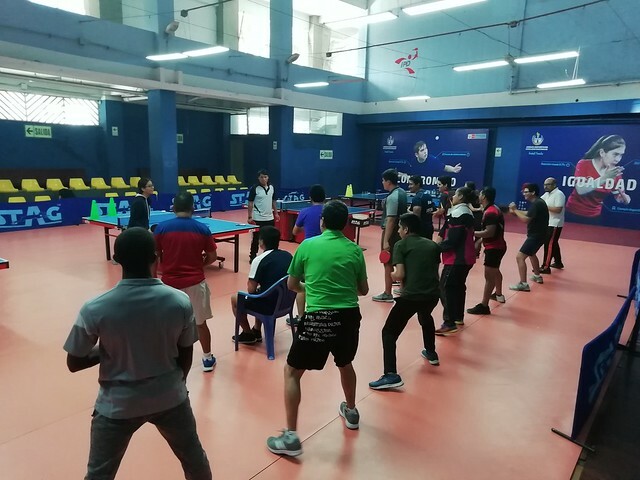 Lima, the host city for the 2019 Pan American Games was the recent home for an ITTF/PTT Level One Course, proceedings commenced on Monday 26th November and concluded on Sunday 30th November. Staged under the auspices of the ITTF Development and High Performance in conjunction with the Peruvian Table Tennis Federation, a total of 18 coaches attended, 15 men and three women, the expert on duty was Venezuela’s Luisana Perez. Notably, a major aim of the Peruvian Table Tennis Federation, under the leadership of Marisol Espineira, is to promote coach education, prioritizing at grass roots level in order to enable affiliated clubs to prosper. Furthermore, for coaches who work at the Peruvian Institute the target is provide the opportunity to enhance knowledge. A most comprehensive course, Luisana Perez focused on the principles required for players to develop their skills. In the schedule, she included basic practice routines, the use of multi-ball and physical training. In addition, the necessary three sessions were allocated to Para play, Furthermore tournament organization was included in the mandatory 30 hour itinerary. Most of the coaches were from the capital Lima, being Jesus Tello, Brenda Cordova, Giancarlo Galvez, Cesar Casquero, Miguel Novoa, Ricardo Cordova, Alexander Meza, Matias Goicochea Nicole Cumpa, Brayan Sirguenza, José Baca, Jordy Diaz, Arturo Santivañez, Jorge Pazos and Alan Blas. Visitors from abroad were Venezuela’s Roxy Gonzalez, Brazil’s Eduardo Marcos and Leonel Aragon.